Converge in a city forever on the verge. 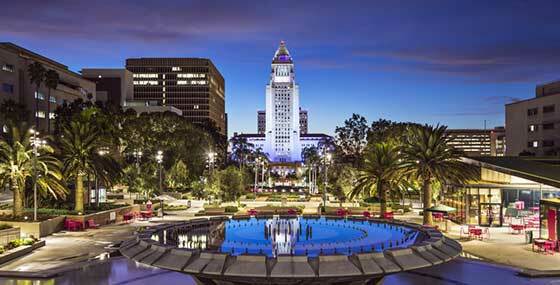 An ever-changing mosaic of eclectic cultures, Los Angeles is a dynamic, global city that is home to more than 4 million people. Amazing opportunities and one-of-a-kind experiences emerge daily in this unforgettable place, where diverse communities and industries collide and thrive. The best way to dive into this vibrant expanse is through its exciting food scene. Here you can set out in the morning for French-pressed coffee at a curbside cafe, wander to a Korean/Mexican-fusion food truck for an Instagram-worthy lunch and top off your day with indulgent Argentinian empanadas, curry from Ethiopia or a burger served up Animal Style from In-N-Out. There are quite literally hundreds of amazing restaurants to chose from, so bring your appetite. Visitors marvel at the array of famous attractions that dot this legendary landscape. Amusements entice kids of all ages from Universal Studios to Disneyland and postcard-perfect Santa Monica Pier. Art lovers can while the day away at The Broad, the Los Angeles County Museum of Art or The Getty Center. World-class shopping summons from Beverly Hills to Hollywood while sporting events and concerts at the massive Staples Center dominate downtown. Whatever is on your itinerary, the UCLA Meyer and Renee Luskin Conference Center is a great home base for exploring all that Southern California has to offer. Just a ten minute walk from the Luskin Conference Center and its Westwood accommodations, this charming community enclave serves as the university’s unofficial college town. 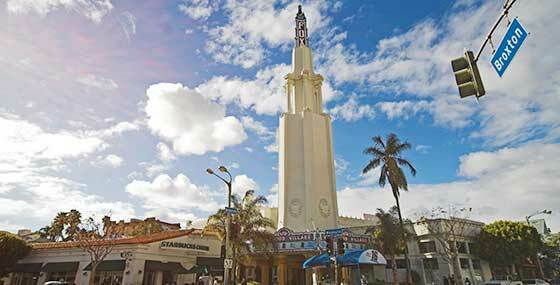 A destination for shopping and dining, it also holds a prominent place in film history, with its vintage landmark theaters that still host movie premieres today. Westwood Village also offers everyday conveniences for those visiting the UCLA Ronald Reagan Medical Center. Beverly Hills attracts well-heeled shoppers from around the world, boasting many upscale fashion houses and boutiques as well as noteworthy restaurants along famous streets like Rodeo Drive. 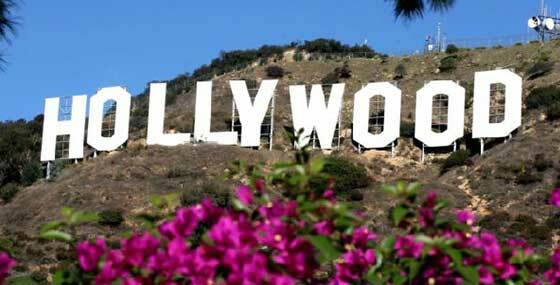 Hollywood is just a short drive away and is one of the world’s meccas for film and entertainment. Visitors enjoy finding their favorite celebrities’ stars along the Hollywood Walk of Fame, posing with life-like wax statues at Madame Tussaud’s, scoping out the backlot at Universal Studios and hiking up (or down) to the Hollywood sign. Downtown Los Angeles is home to a rich history, displayed in magnificent buildings like Union Station, as well as stunning contemporary attractions, like the Walt Disney Concert Hall designed by architect Frank Gehry. Visitors to this area can easily enjoy a variety of cultural experiences in a single day, simply by walking between the close-knit neighborhoods, including Chinatown and Little Tokyo. After a day of exploring, the Luskin Conference Center’s on-campus hotel is a great place to stay at UCLA. 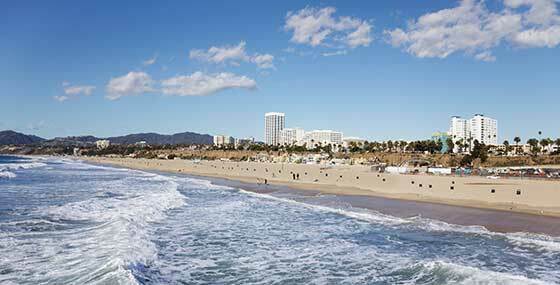 The picturesque Southern California beach cities of Los Angeles are close by the Luskin Conference Center. The Los Angeles coastline is home to many iconic attractions, including the Santa Monica Pier, colorful Venice Beach Promenade, Muscle Beach and more. Visitors to this area can enjoy fresh seafood, innovative California cuisine and a variety of outdoor activities such as biking, hiking and surfing — perfect ways to take advantage of Southern California’s mild and sunny climate. Whatever is on your itinerary, the UCLA Meyer and Renee Luskin Conference Center in Los Angeles is a great home base for exploring all that Southern California has to offer.